Texas is doughnut country. With so many awesome options on almost every corner, it’s nearly impossible to visit them all. 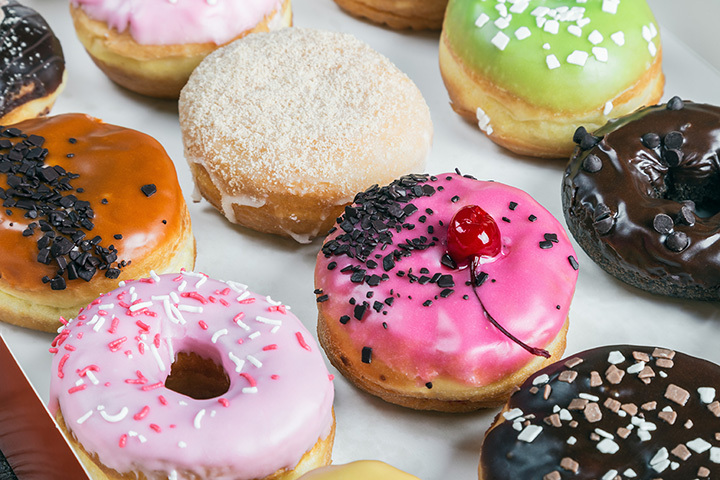 But if you can only visit 10 doughnut shops in the state, make sure to add these to your list. Check out our favorites. Round Rock Donuts in Round Rock, Texas, was founded in 1926. The doughnuts are still made with the same recipe as back then, and still has its distinctive yellow color. Hypnotic Donuts has locations in Dallas and Denton, Texas. The doughnuts are hand-made every day. They are the creators of the “Evil Elvis” doughnut, made with yeast raised doughnut, peanut butter, bacon, banana and honey. Call 24 hours in advance for delivery. River Oaks Donuts makes doughnuts, kolaches, and coffee, but the main attraction are the doughnuts. All of the classics are on the menu, along with filled doughnuts, cake doughnuts, doughnut holes, and custom doughnut options. Earner Gourmet Donuts is a Lewisville favorite. They’ve been in business since 2000 and sell 80 different kinds of doughnuts, kolaches, and baked goods. Specialty doughnuts include Nutella, Butterfinger, croissant doughnuts, and more. Max’s Donut Shop has “by far the best glazed donuts” a recent reviewer has ever had. For those in Allen, Texas, one of Max’s doughnuts is a sure-fire delight. Donutsdatrock in Rockport, Texas, sell fancy doughnuts, candy doughnuts, doughnut holes, fritters, eclairs, and more. Fancy doughnuts include peanut butter chip, apple, pecan, and cherry whereas the candy doughnuts have candy sprinkled on top. AM Donuts opened their Abilene shop 17 years ago and haven’t looked back since. They sell a wide variety of fresh doughnuts, including special holiday treats. The Doughnut Café in Texarkana, Texas, serves beignets, coffee, espresso drinks, in addition to doughnuts. They’ve got cake doughnuts, chocolate covered doughnuts, doughnut holes, eclairs, and much more. Check their website for an up-to-date inventory. Home Cut Donuts from Galveston, Texas, is a family favorite. Skip the bells and whistles for some down-right scrumptious doughnuts. The Donut Shop in Amarillo, Texas has won the Amarillo Globe-News’s Best of Amarillo award every year since 2013. They were the first doughnut shop opened in the city all the way back in 1974 and are stronger than ever with six locations and delicious flavors.